There are routine safety and maintenance steps that you should follow once a month. Review your owner's manual for the door opener. If you do not have an owners manual, look for the opener model number on the back of the power unit and request a manual from the manufacturer. Make sure your opener has a reversing feature. If a reversing feature is not present, it should be replaced. 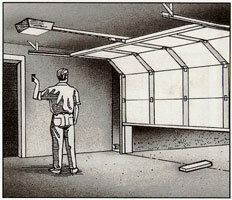 Garage door openers manufactured after January 1, 1993 are required by federal law to have advanced safety features which comply with the latest U.L. 325 standards: Contact your manufacturer or installer for additional information. Test the reversing feature every month. First, test the balance of the door (see "Testing and Maintaining The Garage Door."). If the door is properly balanced, then proceed. With the door fully open, place a 1-1/2" thick piece of wood (a 2"x4" laid flat) on the flooring in the center of the door. If the door does not have reverse, have it repaired or replaced. Have a qualified individual adjust, repair or replace the opener or door. Warning - Springs are under high tension. Garage door springs, cables, brackets, and other hardware attached to the springs, are under very high tension and, if handled improperly, can cause serious injury. Only a qualified professional or a mechanically experienced person carefully following the manufacturer's instructions should adjust them. The torsion springs (the springs above the door) should only be adjusted by a professional. Do not attempt to repair or adjust the torsion springs yourself.